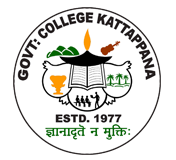 Government College Kattappana, the long cherished dream of the district of Idukki, was established in the year 1977 at Kattappana, the spice garden of India, a place famous for its cardamom and pepper plantations. Ever since, it has been a lamplight in the path of higher education, catering to the needs of the aspiring youth of the highranges. started functioning in a temporary building of St. Jerome’s Church, Vellayamkudy with two Pre-degree batches of the Third and Fourth groups. The college was affiliated to the University of Kerala until the inception of the Mahatma Gandhi University, Kottayam in 1983. It has been affiliated to MG University since then. The infrastructure facilities and other necessities were arranged and managed by a sponsoring committee under the leadership of the then MLA of the Idukki constituency. The college started functioning in the present campus during the 1979-80 academic year when the Government procured 18.7 acres of land and built two temporary buildings for the college. The college was upgraded to the Junior College level in 1989 with the inception of B A Economics course. B Com degree course was started in the year 1990 and B A Malayalam in 1993. B Sc Chemistry course was sanctioned in the year 1999 and B Sc Mathematics was started in 2000. M A Malayalam, the first postgraduate degree course of the college, also was started in the same year. The college started M Com course in 2013.
technical facilities also. The academic results have shown remarkable progress in recent years. The college has achieved hundred per cent results in some of the programmes while others have about ninety percentage of success rate. The college submitted Self Study Report to NAAC for accreditation - cycle I in December 2015. Two new courses, M A Economics and M Sc Chemistry were started in the 2016-17 academic year. In September 2016, the college was accredited with 'A' grade by the National Assessment and Accreditation Council (NAAC).